In April 2017, I was notified that I was selected by a panel of museum curators and antiques experts as superior in craftsmanship for my Historic Townscapes! I now join a select group of heritage artisans who are listed in The Directory of Traditional American Crafts sponsored by Early American Life Magazine. View the 2016 directory at www.ealonline.com; the 2017 Directory will be on-line in June or July. I take great pride in each piece that I design and make. No two are ever exactly alike and I rely on time-honored methods like false-graining, stenciling, hand painting with oils, decoupage, and crackle-glazing to produce unique decorative arts and finishes. My specialty! Using 19th-century black and white etchings or historic photographs for inspiration, I create small oil paintings that reflect how buildings, towns, and villages once looked. 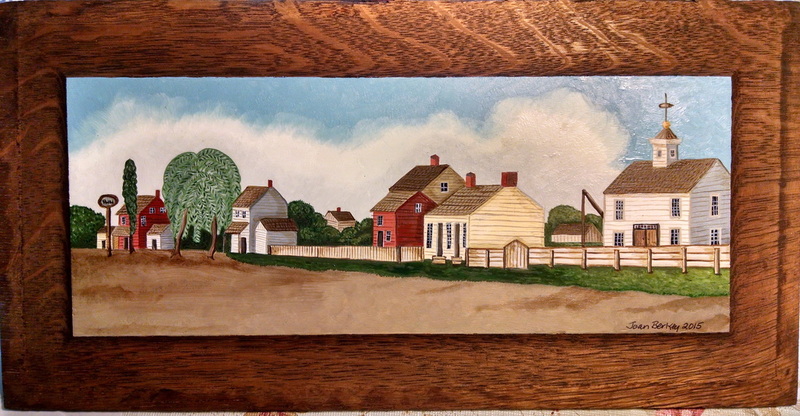 I use mostly raised panels (some vintage or antique, others made by my carpenter husband) as my "canvas" to give an old-fashioned look that modern framing cannot. There are several resources you can explore on my townscapes page for etchings of villages and towns in Pennsylvania, Ohio, New Jersey, New York, Connecticut, and Virginia. Using antique raised panels recycled from cupboards and shutters, I paint (using oil paints) unique signs that can be customized to your specifications. Theorem painting, or stenciling on white cotton velvet (or paper), is an art form that was taught to young girls attending finishing school in the early to mid-19th century. Designs range from simple to complex and from small to large; they often feature flowers, fruit baskets, or animals. I hand-cut my own stencils and many of my theorems are copies of 19th-century designs. I also false grain or milk paint the custom-made pine frames for an authentic look. I paint wooden boxes of all sizes. My husband makes the larger ones for me (he's a talented cabinetmaker! ), and I also use vintage and modern pantry boxes. 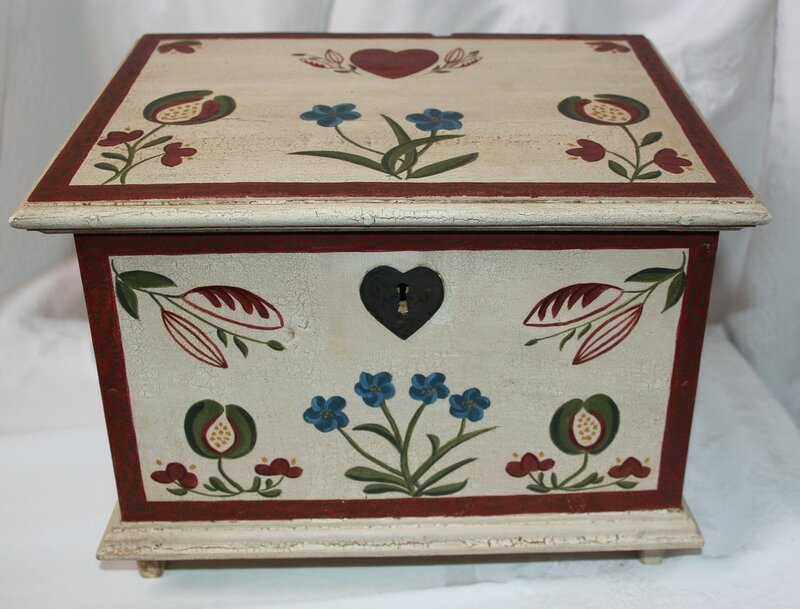 I apply stenciled designs, hand-colored decoupage prints, or free-hand painted pictures and motifs. Some are copies of antiques, like the one below; others are from my imagination but are often based on historic precedents.